An incredibly potent age-defying treatment serum, Blue Diamond Concentrate not only awakens and illuminates skin showing signs of fatigue, but helps reverse all visible signs of skin ageing – from fine lines and wrinkles, to dark spots and loss of firmness – with a souped-up cocktail of powerful actives. Alongside advanced diamond peptides, this reparative elixir contains a combination of copper, essential amino acids and an anti-glycation phosphate to kick-start elastin and collagen synthesis (Omorovicza’s patented delivery system ensures that these powerful actives are utilised by cells in their intended combination, for renewed skin strength, firmness and resilience), while wheat polysaccharides provoke an immediate ‘lifting’ effect and simultaneously reduce the depth of wrinkles to recapture skin’s vitality. Sodium hyaluronate fraction ‘plumps’ and firms, while copper gluconate helps regulate oil production, to control shine and leave skin matte but gorgeously glowing. Harnessing the unique ability of Omorovicza’s Nobel Prize-winning ‘Hydro Mineral Transference’ technology, the Blue Diamond collection helps restore cell energy and in turn, supercharge the skin’s ability to renew, repair and ‘age-defy’ itself. 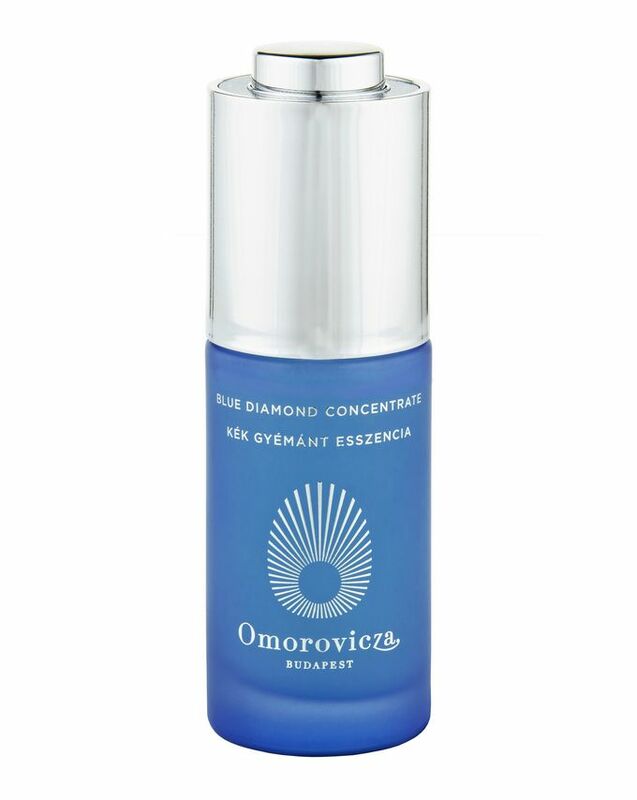 A super-charged vitality booster, Blue Diamond Concentrate stars diamond peptides – small chains of 3 – 5 amino acids, grafted to multifaceted diamonds – which are transported directly to skin cells where they trigger cellular repair processes; ‘tricking’ cells into believing precious collagen has been compromised, so that they set about creating more whilst counteracting signs of stress. The silky serum glides on effortlessly and absorbs almost instantly to correct and perfect your complexion, while arabinogalactans (a Nasturtium-derived polysaccharide), accelerates oxygenation of cells to optimise their and re-energises fibroblasts to leave skin looking brighter, toned and smooth. A must-have addition to every youth-prolonging skin arsenal. Apply daily after cleansing and massage gently. Follow with Blue Diamond Super Cream for optimal results. This product is maybe the best product on the beauty market. My skin is quite redish and dry and when applying the Blue Diamond Concentrate, you can see straight away that it is the best quality ever. Pricey of course but you will never ever find such a rich and intense serum. You only need a very tiny amount of the product each time which make it last for very long. I love this brand and have ordered and reordered many products from Omorovicza (a few are permanently part of my beauty product repertoire); this serum however was a disappointment. It seemed to actually cause my skin to dry and flake. It doesn't feel nice after going on. My skin is very dry and I live in an air conditioned environment. I am in my thirties. As it was so expensive, I did end up using the bottle up by using on décolletage area etc., but I saw zero results from this product and in fact it seemed to make my dry skin even more dry. I was very very disappointed in this product, given the steep price especially. I would be interested to see if it worked better on other skin types.